One of the main advantages of pendle axles is that they distribute the weight of the load over the road surface better than beam axles or split axles with independent suspension. Therefore the maximum axle weight for pendle axles is higher in several European countries. At the moment only 2-axle low-loaders with pendle axles, such as the Nooteboom Euro-PX, are allowed 12 tonnes per axle with exemption in Germany. All other 2-axle low-loaders with beam axles or split axles are restricted to 10 tonnes per axle. Within the German regulations two different kinds of axles are specified: beam axles and split axles. Pendle axles as well as axles with independent suspension are classified as split axles. This year the Ministry of Transport has decided to no longer issue exemptions for 12 tonnes per axle when it concerns a 2-axle semi-trailer. Only if the semi-trailer is equipped with pendle axles an exemption for 12 tonnes will be granted. 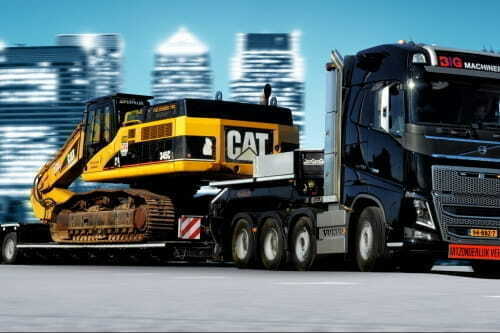 The German BSK (Federation of Heavy Transport and Crane Operators) has asked the Ministry of Transport to align the 2-axle low-loaders with independent suspension along with those equipped with pendle axles, as is currently the case with semi-trailers that have more than 3 axles. As a result of this request by the BSK, the Ministry of Transport of Baden-Württemberg has made two important decisions. The first decision stipulates that the BASt (Federal Highway Research Institute) is given the task of comparing the difference between the weight transmitted to the road when using split axles with independent suspension to the weight when using pendle axles. In the other decision it is laid down that throughout Germany – pending the results of the investigation – 2-axle semi-trailers with pendle axles will be granted exemption for 12 tonnes per axle and 2-axle low-loaders with independent suspension will be granted only 10 tonnes per axle. The Dutch regulations also distinguish two kinds of axles: beam axles and pendle axles. All types of axles with independent suspension are currently classified as beam axles. In spite of several requests to increase the axle weight, independent suspension with a long-term 100-tonnes exemption will not be granted more than 10 tonnes per axle. Within the same exemption regulations it is stipulated that pendle axles have a maximum load capacity of 12 tonnes per axle. For 2-axle low-loaders with independent suspension the difference is even greater, because in combination with a 3-axle tractor the total weight stays under 50 tonnes. And therefore does not qualify for an exemption for the weight. The result: 9 tonnes per axle for a 2-axle semi-trailer with independent suspension and 12 tonnes for a semi-trailer with pendle axles. In practice this means the 2-axle low-loader with pendle axles, such as the Nooteboom EURO-PX, has 6 tonnes more load capacity than a similar low-loader with independent suspension, such as the SL, Panther, MPA and Twinaxle-2. French legislation divides abnormal transport into three categories. The law distinguishes three kinds of axles: beam axles, split axles and pendle axles. To determine the maximum gross weight, beam axles and split axles (with independent suspension) are treated the same. An exception is made for pendle axles. In Category 3 they may be allowed higher axle weights than beam axles and axles with independent suspension. This depends on the number of axle lines, the distance between the axles and whether single or double mounted tyres are fitted. Vehicles fall under Category 3 as soon as the laden vehicle is longer than 25 metres, wider than 4 metres or has a total weight of more than 72t. The Nooteboom EURO-PX low-loader is the result of technical development over many years. The higher load capacity that is now permitted in Germany for the 2-axle Nooteboom Euro-PX shows that innovation has practical benefits too. Three important European countries – the Netherlands, Germany and France – recognise the advantages of pendle axles over independent suspension. The result: up to 3 tonnes more load capacity per axle line.